Finally… An Exclusive Auto Dealership Brokerage Consisting Solely of Dealership Lawyers and Accountants. 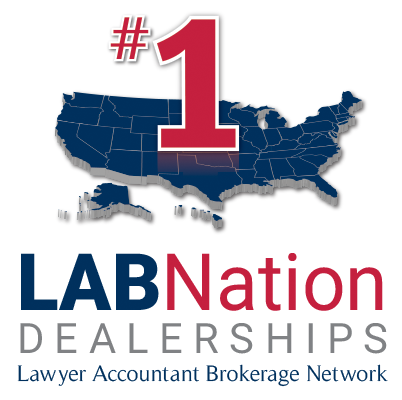 LABNation is the largest auto dealership brokerage in the US. While most dealership brokers have less than ten agents, the LABNation team surpasses 200 licensed professionals. The auto dealership buy-sell world has never had a brokerage that resembles a Multiple Listing Service, until now. Most important, every team member in LABNation is a trusted and experienced dealership lawyer or accountant. This translates into a much more profound reach in terms of identifying listings and procuring qualified buyers. Even more, “confidentiality” is the mainstay of the life work of these lawyers and accountants. This is vitally important to sellers. Accordingly, confidentiality is the core value of our lawyer-accountant brokerage network. LABNation is a full-service dealership brokerage. We are with sellers each step of the way until their transactions close – from developing detailed valuation estimates, creating customized marketing to negotiating letters of intent and helping sellers address buyer concerns that might otherwise delay or prevent closing. Through our experience and understanding of automotive dealerships, we give sellers the best chance of closing a buy-sell transaction at an optimal purchase price. It is no secret that most marriages between buyers and sellers of auto dealerships are made by lawyers and accountants. Up until now, however, a dealership lawyer or accountant would simply refer a potential sale to a third-party broker, a complete stranger to the dealer and the dealer’s business. As such, the most intimate aspect of a dealer’s business cycle was being outsourced to an unknown entity. That ends with LABNation. Now a dealer can keep his or her most trusted advisors in the buy-sell process. Unlike other brokers, LABNation team members have built their reputations with dealers over many years helping clients successfully manage their business. As an added bonus, dealers will pay a lower commission with LABNation. We only ask for commission on a dealership’s assets and do not charge commission for the sale of any real-estate tied to the dealership. Our commissions are also tiered based upon the size of the transaction. No one knows dealership buy-sell transactions better than our network of lawyers and accountants. Each of our team members have extensive experience keeping deals alive, working with auto manufacturers to get deals approved, and keeping dealership owners, general managers and staff focused on moving a deal forward. Additionally, these lawyers and accountants are experienced in working on these deals in strict confidence as part of their professional obligations. As a result, our team members are well-prepared to handle any buy-sell transactions they broker with complete discretion. A contribution from each commission will be made to Dealers vs Cancer, a fundraising arm within the Prostate Cancer Foundation established in 2016 by LABNation’s Founder and CEO. If You are Buying or Selling a Dealership, Contact LABNation Today. LABNation Represents Hundreds of Clients Nationwide in the Purchase and Sale of Dealerships. Lawyers and accountants are always the first to know when a dealer wishes to sell a dealership. Through LABNation’s network, a buyer can access these sellers in an expedient manner. LABNation team members can also identify clients who may not currently have dealerships up for for sale but might consider doing so for the right terms. If you are selling a dealership, LABNation provides you with unparalleled exposure from our 200 team members, each of whom will promote your listing to clients. Working with LABNation, you will no longer have to rely upon a brokerage with a small number of agents who often don’t share listings. Through significant our commitment to advertising, our promotion of your dealership will reach a level that is unsurpassed among dealership brokers. Copyright © 2019 LABNation. All Rights Reserved.